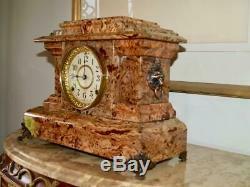 RARE SETH THOMAS ADAMANTINE BRAZILIAN WALNUT CLOCK c1895 IN EXCEL. Melbourne (Narre Warren) Pick-up available or will post. IF YOU LOOKING FOR THAT SPECIAL CLOCK PLEASE DO NOT MISS THIS ONE. 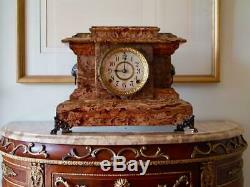 This very attractive and very rare mantel clock features beautiful adamantine. Case, side lion handels and lovely. The case is in very nice original condition with very little wear to the the adamantine - nothing serious and almost invisible to the naked eye. The clock looks very fresh and shiny for its age(over 134 years old). This is a very special and rear model to find in working order. Original paper label is attached to the bottom of the clock. 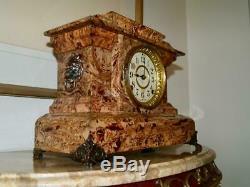 Overall the clock is in great condition. Please look at my detailed photos for more information. The brass 6 (15cm) and paper original dial face with Arabic numerals is in super condition. Brass bezel opens and closes tightly and is showing nice patina. The original 8 day time & strike brass movement is in VERY GOOD WORKING. 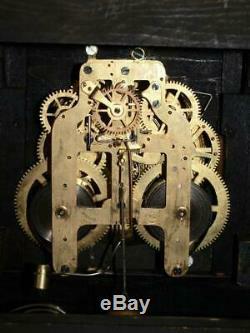 This spring wound movement strikes on a beautiful rich cathedral gong on the hour and on the half hour. This clock features the patent regulating machanism. If the clock is running fast or slow, turn to the desired direction as indicated on the dial ("S" for slow "F" for fast) to obtain perfect time. 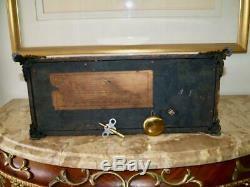 To finish off , this clock will come with original SETH THOMAS pendulum. Clock wil come with correct replacement key. The clock stands at 11.5. Inches (29cm) high, 17 inches (43cm) long, and 6 inches (15. I also include instructions in the package for correct unpacking and setting up the clock. Many thanks for looking and good luck. Items can be collected from Narre warren 3805, Melbourne, cash on pick-up or bank transfer is fine. All items are sent via registered post. This ensures that the item can be tracked. IF IN RARE OCCASION I WILL QUOTE MORE THEN. Many thanks and good luck. YOU CAN ALSO VISIT THE AUSTRALIA POST WEBSITE FOR FURTHER INFORMATION. Every effort is taken to describe the item correctly. All clocks listed are fully working unless otherwise stated. You can appreciate that the clocks listed are all antiques and are at least 100 years old. 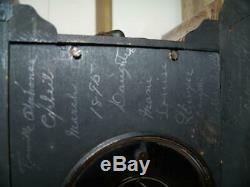 This means that they will not be perfect and will show signs of use such as marks, natural aging, and patina. I commonly refer to these as beauty spots and they are part of the charm and history of the timepiece. 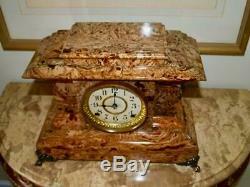 Please browse thru my detailed photos, as they form part of the description of the item. Every effort is taken during packing to ensure the clock is running when you unpack it. This is normally quite easy and I supply with every clock instructions for setting up and adjusting the clock once unpacked. Additionally, I can be contacted should you require further information about your timepiece. Please contact me if you have any questions or require additional pictures. Get Supersized Images & Free Image Hosting. Create your brand with Auctiva's. Attention Sellers - Get Templates Image Hosting, Scheduling at Auctiva. 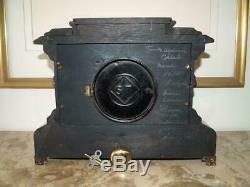 The item "RARE SETH THOMAS ADAMANTINE BRAZILIAN WALNUT CLOCK c1895 IN EXCEL. WORKING COND" is in sale since Monday, April 1, 2019. This item is in the category "Antiques\Decorative Arts\Clocks". The seller is "andrzej2850" and is located in Narre Warren.